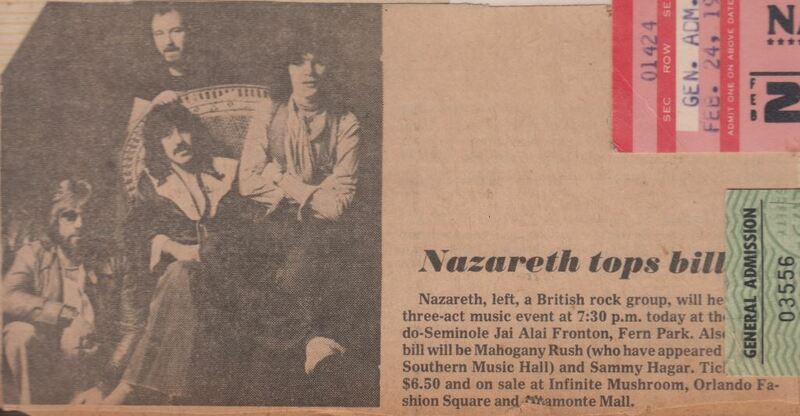 A newspaper clipping about a concert featuring Nazareth with Mahogany Rush and Sammy Hagar (b. 1947) at the Orlando-Seminole Jai Alai Fronton in Fern Park, Florida. The concert took place on February 24, 1978, and was presented by Albert Promotions and FM 107. The ticket price was $6.50. 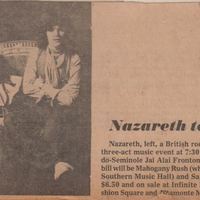 This clipping contains a photograph of the members of Nazareth, from left to right, bottom to top: Darrell Sweet (1947-1999), Manny Charlton (b. 1941), Dan McCafferty (b. 1946), and Pete Agnew (b. 1946). Orlando-Seminole Jai Alai Fronton was built in 1962 and hosted concerts, graduations and events in addition to jai-alai matches, which remained popular through the mid-1980s, when its popularity began to decline. The building was rebranded Orlando Live Events (OLE) in 2014. It is located at 6405 South U.S. Route 17-92 (U.S. 17-92) in Fern Park. Original newspaper article: "Nazareth tops bill." February 24, 1978: Private Collection of Julie Wahl. Digital reproduction of original newspaper article: "Nazareth tops bill." February 24, 1978. Copyright to this resource is held by Julie Wahl and is provided here by RICHES of Central Florida for educational purposes only. Comas, Martin E. "As sport declines, Orlando Jai-Alai adds movies, other events." The Orlando Sentinel. (October 20, 2013). Accessed February 24, 2015. http://articles.orlandosentinel.com/2013-10-20/news/os-orlando-jai-alai-fronton-events-20131020_1_orlando-jai-alai-francisco-elorriaga-national-jai-alai-association. “Nazareth Tops Bill.” RICHES of Central Florida accessed April 19, 2019, https://richesmi.cah.ucf.edu/omeka/items/show/4780.